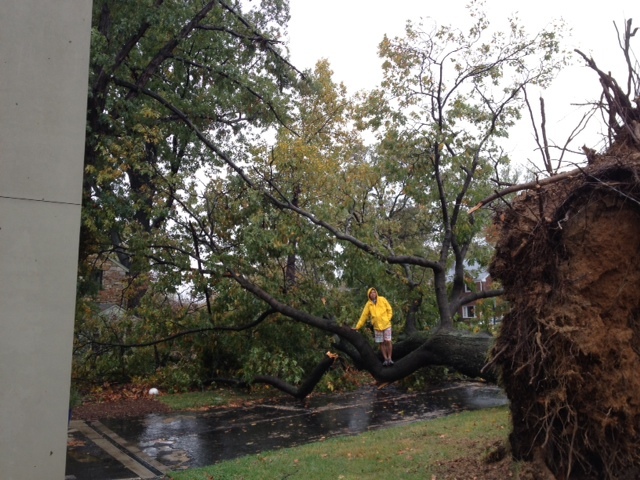 The homeowners reviewed several tree service providers to remove their beloved black oak downed by Hurricane Sandy. Finding a qualified tree service is important protection for the homeowner. Sometimes less credible tree follow storms for a quick buck and blow out of town as fast as the storm. A professionally trained arborist can determine if a tree can be saved. Even if the tree must be removed, safety and training are still needed to prevent additional damage from te removal. Most chainsaw injuries occur during storm cleanup. In a time of disaster, a fast recovery is desirable, but not taking the time to hire a reputable tree service may create greater problems in the future. The worst result of haste may be paying in advance for tree work that is never completed. Be sure to read tips on selecting a tree service provider at http://treestewards.org/2012/08/24/how-to-select-an-arborist-or-tree-service-company/. To find an ISA Certified Arborist near you and for more information on storm-recovery tree care, please visit www.treesaregood.net or contact ISA at (217) 355-9411. 1. Do not try to do it all yourself. If large limbs are broken or hanging, or if ladder or overhead chain saw work is needed, it is a job for a professional arborist. 2. Take safety precautions. Look up and look down. Be on the alert and stay away from downed utility lines and dangerous hanging branches that look like they are ready to fall. 3. Assess the damages. Evaluate your trees carefully by asking the following questions: Other than the storm damage, is the tree basically healthy and vigorous? Are major limbs or the leader (the main upward-trending branch on most trees) branch still remaining? Is at least 50 percent of the tree’s crown (branches and leaves) still intact? Are there remaining branches that can form a new branch structure? If you answered “yes” to the majority of these questions, there is a good chance for complete recovery. For assistance, hire an ISA Certified Arborist to determine the tree’s conditions. 4. Remove any broken branches or stubs still attached to the tree. Removing the jagged remains of smaller sized broken limbs to minimize the risk of decay agents entering the wound. Smaller branches should be pruned at the point where they join larger ones. Make the cut with a handsaw – with a chain saw it could create a hazard. For larger branches that are broken, a professional arborist who has the necessary equipment and knowledge needed to do the job safely should cut them back to the trunk or a main limb. 5. Resist the urge to over-prune Do not worry if the tree’s appearance is not perfect. With branches gone, your trees may look unbalanced or naked. You will be surprised at how fast they will heal, grow new foliage, and return to their natural beauty. 6. Do not top your trees! Untrained individuals may urge you to cut back all of the branches, on the mistaken assumption that it will help avoid breakage in future storms. However, professional arborists say that “topping,” the cutting of main branches back to stubs, is extremely harmful and unhealthy for your trees. Stubs will often grow back many weakly attached branches that are higher and are more likely to break when a storm strikes. Also, topping will reduce the amount of foliage, on which the tree depends for the food and nourishment needed for re-growth. A topped tree that has already sustained major storm damage is more likely to die than repair itself. This entry was posted in Community Service, Education, Tree Care and tagged arborists, first aid for trees, storm damage, storms. Bookmark the permalink.